Sending Perishable items? We recommend sending on our before noon service to ensure items arrive in best possible condition. Certainly use this service if the items are needed on a timeline, as we are able to upgrade them if there are any delays. Also, please bear in mind that its not just the weight of your item/s, all chilled parcels require Ice packs, which typically add 1-2 kg or more per parcel. Ideally, we don’t recommend "just in time” delivery’s, although sometimes there is no other option, and rest assured we will always do our best to dispatch same day if needed. We use UKMail and delivery cost is dependent on the parcels weight. For small parcels, with a packed weight of under 1.5kg, delivery starts from £6.99. Scottish Highland, Island and Norther Island parcels are dispatched with UKmail. We do not use a Royal Mail Service. 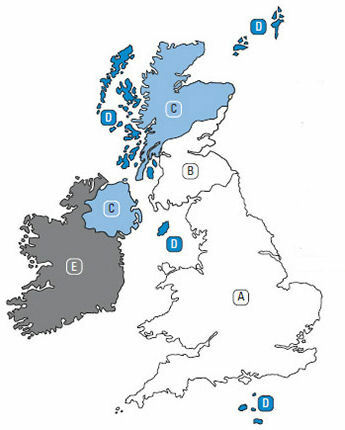 The UKmail service is generally a 2 day service to the more remote parts of Scotland. Price wise, the Ukmail and Royal Mail rates are similar, and bear in mind if you buy 1kg of Cheese, that arrives packed with two ice sheets, a box and the packaged weight isn`t 500 grams, but 2.4kg or more. For large bulky orders, please click here for volumetric pricing information.